Elevation of 4,150 feet (1,260 m). 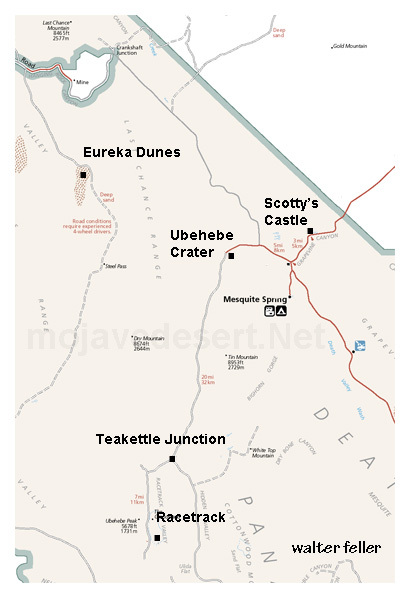 Teakettle Junction is the junction of Hunter Mountain and Racetrack roads approximately 6 miles north of Racetrack Playa and 21 miles from Ubehebe Crater. 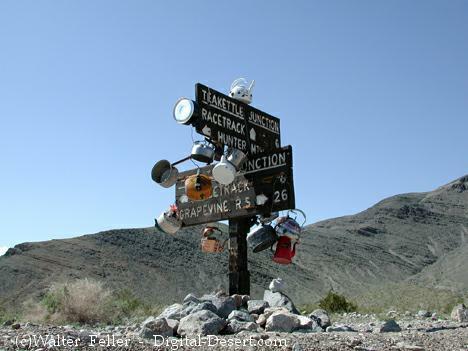 An odd custom is to place a teakettle on the signpost. After awhile the teakettles are removed by the National Park Service as litter. An interesting supposition regarding the name would be a story about Teakettle Lane in Victorville, Ca. Teakettle Lane was a bumpy, rocky, dirt road which would jar one frantically to and fro as automobiles made their way down the little trail much as a happily whistling little teapot with rapidly boiling water would bounce on the burner of a stove.